Born and raised in Colombia until the age of 8, Mujahid Fletcher migrated with his family to Houston, TX. After a turbulent adolescence filled with gang violence and serious trouble, his parents sent him back to his homeland where Fletcher says his life took a positive turn. He returned two years later to Houston and shortly thereafter was introduced to Islam by a friend. After studying the religion for a year, he embraced Islam, and later founded IslamInSpanish, a non-profit organization which provides Islamic audiovisual products and services in Spanish. 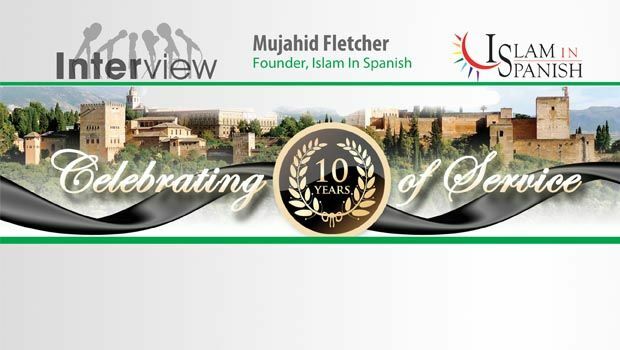 IslamInSpanish recently celebrated its tenth anniversary with a banquet and fundraiser held in Dallas, TX. Q What were some of the difficulties you encountered as a new Muslim? A A few months after I became a Muslim, September 11th happened and I found out that there was no Spanish material to hand my father or anyone else who wanted to know about Islam. I was asked by the Islamic Society of Greater Houston to speak in front of the Spanish media to inform the public about Islam, and after discussing Islam further with my father, he converted three months after me. He then told me that if no audiovisual material had been created to educate Latinos about Islam, that it should be my responsibility to produce it. This challenge led to my wife and I enrolling in the Art Institute of Houston to obtain degrees in Multimedia and Graphic Design. What drove us was the fact that Muslims seemed very weak or unprepared to portray Islam effectively through the media, so we made this our life goal, and graduated with honors as a young 22- and 24-year old new Muslim Latino couple. Q What are you contributing to dawah to both Spanish speakers and non-Spanish speakers (including your family)? A One of my humble contributions to dawah in the Spanish language is the founding of the non-profit organization IslamInSpanish, which for more than ten years has been producing much needed audiovisual multimedia Islamic material in Spanish to educate Latinos about Islam worldwide. I am the founder, and as such, a multimedia film and television producer. My father has been the audio narrator and my wife is the graphic designer. My mother, mother-in-law, wife’s aunt, and many others in our family have embraced Islam, along with thousands worldwide via our website www.IslamInSpanish.org and other social media outlets such as www.Facebook/IslamEnSpanish, our YouTube Channel IslamInSpanishTV which has thousands of views on the video uploads, and through television channels locally, as well as internationally from Madrid, Spain. Q What other type of services does IslamInSpanish provide? A We’re also invited to speak in Spanish and English at public places such as universities, churches, synagogues, Sam’s Club, conventions, and other venues, mainly about what Islam is and who Muslims are from a Latino’s perspective, and about the Muslim Latino experience. I have personally had the chance to speak at Harvard University, Rutgers University, Unitarian churches, Catholic radio stations, Sam’s Club for cultural sensitivity training in Ramadan, and will be speaking at a synagogue’s confirmation class this coming month. Muslim-owned businesses also request that we visit employees who are interested in knowing about Islam. Q What are some of the hurdles you’ve had to overcome in your outreach projects? IslamInSpanish has produced the first 26-CD set of a Spanish translation of the Qur’an, as well as producing audios in Spanish of other classical works such as 40 Hadith Al Nawawi, The Sealed Nectar (Biography of Prophet Muhammad), and very informative CDs such as Get to Know Jesus and Mary in Islam, Get to Know the Quran, and Get to Know the Prophet of Islam. Q In your opinion, what are some of the greatest accomplishments of IslamInSpanish? A Today we are the number one authentic source of Islamic multimedia in Spanish to educate Latinos about Islam, and now after ten years we are about to travel to areas where people may not have heard of us or where we have not held live events, in order to increase our reach and awareness. Over the last five years we have raised and invested $200,000 into our production studio called “Andalucia Media Arts Center (www.AndaluciaCenter.org).” We have produced over the last ten years more than 500 audiobook titles and 200 television shows to date. We carry out a signature Open House for Latino Non-Muslims across the U.S. entitled “Islamic Roots in the Latino Culture” — “Raíces Islámicas en la Cultura Latina” — where hundreds of people have embraced Islam. Other live event workshops are given to non-Muslims. Two weekly Spanish classes are held in Houston and two Spanish khutbahs are delivered monthly, which is a pioneering activity we hope, in the future, to take place all throughout the U.S.
Q What is the best approach for presenting Islam to Latinos here and at home [in our countries]? A First, we have learned that it is key to connect with people based on where they are in life. Everyone in general wants good for themselves and their families. If they can help someone, a good number of people will do so. The way we approach people when speaking to them is the way we want to be spoken to. It is not about debate or bashing, this is negative in nature. This is a golden rule found in Islam as it is a universal way of life. Therefore, the heart of the listener connects to the heart of the speaker based on the mutual cultural context of the language in order for the deepest sense of communication to be established. This is the reason why IslamInSpanish events are carried out in the native language of the people it serves. If the audience speaks English, we can deliver the information in English as well, but anyone who knows Spanish and hears the same information in his or her native tongue, its impact and long-lasting effect is high to the point of acceptance of, or at least empathy toward, Islam and Muslims.